Picture: Christian G.E.Schiller with Massimo “Max” di Lenardo from Friuli, Italy at Paul’s on Wisconsin Avenue in Washington DC. Massimo “Max” di Lenardo from Friuli, Italy, was in Washington DC and I had the opportunity to meet him and taste his wines at Paul’s on Wisconsin Avenue, in Washington DC. Massimo "Max" di Lenardo is consistently cited by Gambero Rosso as producing fine wines in the Friuli-Venezia-Giulia region about 70 miles northeast of Venice. The di Lenardo family has made wine at its farm at Otagnano di Gonars since the 1800's, but it was not until Max di Lenardo took over the family business in 1985 that the estate came into real prominence. Italy's classification system has 4 groups of wine: (1) Vino da Tavola (VDT) – table wine. 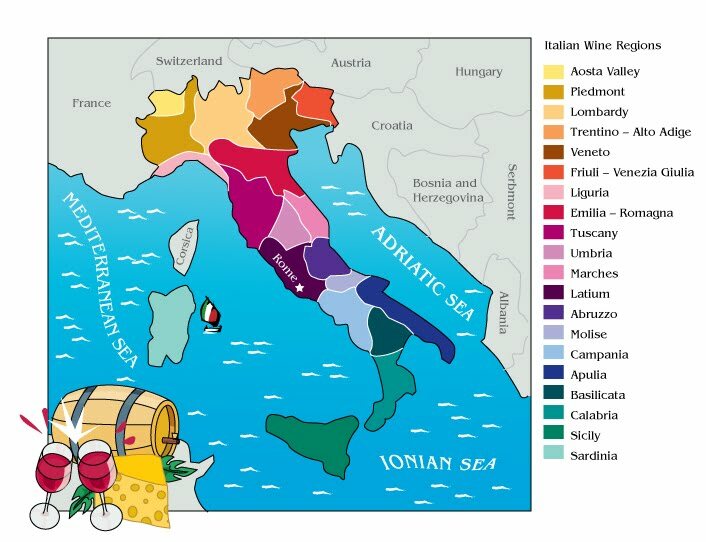 (2) Indicazione Geografica Tipica (IGT – the most recent laws promoted many of the finer table wine regions to IGT status), (3) Denominazione di Origine Controllata (DOC) and (4) Denominazione di Origine Controllata e Garantita (DOCG). Both DOC and DOCG wines refer to zones which are more specific than an IGT, and the permitted grapes are also more specifically defined. Presently, there are about 120 IGT zones, 310 DOC and 30 DOCG appellations. 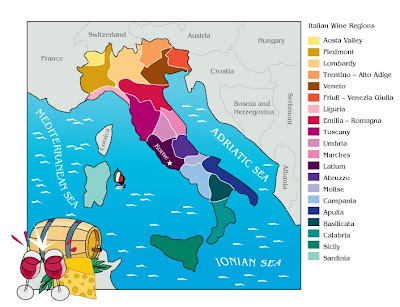 There is wine everywhere in Italy, from the Alps in the North to Sicilia in the South, clustered into 20 wine regions, which correspond to the 20 administrative regions. The about 30 DOCG wines are located in 13 different administrative regions but most of them are concentrated in Piedmont and Tuscany. The Piedmont area of northwestern Italy is further divided into two popular regions, Barbaresco and Barolo; the predominant grape there is the Nebbiolo. The large area in central Italy is Tuscany and is known for Chianti; the Sangiovese is the predominant red grape in Tuscany. In Italy’s South are Puglia and the island of Sicily. Rosso/Red: (1) Sangiovese - Italy's claim to fame, the pride of Tuscany. It produces Chianti and Brunello di Montalcino. (2) Nebbiolo - The most noble of Italy's varietals. Nebbiolo is difficult to master, but produces the renowned Barolo and Barbaresco. (3) Montepulciano - The grape of this name is not to be confused with the Tuscan town of Montepulciano; it is most widely planted on the opposite coast in Abruzzo. (4) Barbera - The most widely grown red wine grape of Piedmont and Southern Lombardy, most famously around the towns of Asti and Alba, and Pavia. Barbera wines were once considered as the lighter versions of Barolos. (5) Corvina - Along with the varietals Rondinella and Molinara, this is the principal grape which makes the famous wines of the Veneto: Valpolicella and Amarone. (6) Nero d'Avola - Nearly unheard of in the international market until recent years, this native varietal of Sicily is gaining attention for its plummy fruit and sweet tannins. (7) Dolcetto - A grape that grows alongside Barbera and Nebbiolo in Piedmont; a wine for everyday drinking. Picture: Christian G.E.Schiller with Massimo “Max” di Lenardo from Friuli, Italy at Paul’s, on Wisconsin Avenue, in Washington DC. Bianco/White: (1) Trebbiano - Behind Cataratto (which is made for industrial jug wine), this is the most widely planted white varietal in Italy.Mostly easy drinking wines. (2) Moscato - Grown mainly in Piedmont, it is mainly used in the slightly-sparkling (frizzante), semi-sweet Moscato d'Asti. (3) Pinot Grigio - A hugely successful commercial grape, known as Pinot Gris in France and Grauburgunder in Germany. Produces crisp and clean wines. Typically mass-produced wine in Italy. (4) Arneis - A crisp and floral varietal from Piedmont, which has been grown there since the 15th century. (5) Garganega - The main grape varietal for wines labeled Soave, this is a crisp, dry white wine from the Veneto wine region. The di Lenardo Vineyards is based in the north-east of Italy, in the Friuli-Venezia Giulia wine region. Once part of the Venetian Republic and with sections under the influence of the Austro-Hungarian Empire for some time, the wines of the region are said to have noticeable Slavic and Germanic influences. The Friuli-Venezia Giulia region is bordered by the Alps to the north separating it from Austria. Slovenia borders the region on the east and the Italian regions of Veneto forms the western border and part of the southern border with the Adriatic Sea. There are 11 DOC, 3 DOCG and 3 IGT designations. Almost 2/3 of the wine produced in the region falls under a DOC designation. The area is known predominantly for its white wine - with fruit and acidity and little, if any, oak, resembling. The di Lenardo family has cultivated vines in Ontagnano, just a few miles away from Udine, since the early 1800s. But it was not until Massimo “Max” di Lenardo took over his family’s wine production in 1985 that quality took a real leap forward. The decision to use only grapes produced by the family’s own vineyards was coupled with a change in the winemaking philosophy, including new plantings of vines with an increased density (up to 6000 per hectare). Before Massimo entered the scene, the wine was sold in bulk and not bottled. “The grapes are now picked by hand, fermentation takes places at an electronically controlled temperature. In fact, we have the most sophisticated state of the art facility in the area.” said Massimo. Interestingly, “100 percent of the energy used in the winery is solar energy” said Massimo. Pictures: Massimo “Max” di Lenardo from Friuli, Italy at Paul’s, on Wisconsin Avenue, in Washington DC. The di Lenardo Vineyards comprises four large vineyard areas in different parts of Friuli-Venezia-Giulia - VIGNE DAI VIERIS , VIGNE DA SAN MARTIN , VIGNE DA LIS MARIS and TIARE D'ALBE - totaling 40 hectares, compared with an area of around 150 hectares of the whole estate. In addition, an area of 5 hectares is under a long-term lease. In 2010, du Lenardo Vineyards produced around 600.000 bottles of wine, of which about ¾ are exported. Alc. 13 % by vol. The whole berries were pressed gently in a pneumatic press. After a first racking, the must was transferred to temperature-controlled fermentation still vats. The wine stayed on the lees until bottling. Clarification of the musts made with a new "state of the art" flowtation bio-system. Bottled under vacuum. Friulano is a grape indigenous to Friuli, and it is the most popular and most widely planted white grape variety of the region. TOH! is di Lenardo Vineyards’ flagship wine, having garnered awards year in every vintage. 60.000 bottles. Alc. 13 % by vol. The whole berries were pressed gently in a pneumatic press. After a first racking, the must was transferred to temperature-controlled fermentation still vats. The wine stayed on the lees until bottling. Clarification of the musts made with a new "state of the art" flowtation bio-system. Bottled under vacuum. A wine with 100% Chardonnay "Musque", a "clone" of the Chardonnay grape sourced from the French national nursery at Tours. Alc. 14% by vol. This small production wine is made from 100% Estate grown Merlot coming from vines with an average age of 25 years. But what makes it so special is how the wine is made. One third of the grapes are dried on racks for a month before pressing (a practice used in the making of Amarone). This process is called appassimento or rasinate (to dry and shrivel) in Italian. This gives the wine an incredibly rich, spicy complexity and dark inky color that is enhanced by 18 months in small American oak barrels. 10.000 bottles. Alc. 12,5% by vol. Harvested early to have a higher acidity and than dried 3 months on the racks to concentrate the sugars. Verduzzo is the grape, one of the indigenous varieties of Friuli. Noticeable sweetness. 10.000 bottles. Siema Wines organized a wine tasting at the Wine Cabinet in Reston, Virginia, with winemaker Werner Michlits (Weingut Meinklang) from Austria, who was not personally present but virtually – via a Skype connection. Werner was sitting in his winery in Austria at 8:00 pm local time while we were sipping his wine at 2:00 pm local time in Virginia. He had opened the same wines we tasted, so we would show him the bottles via Skype and then he would sip and talk with us about the wines. Interestingly, Werner Michlits is not a mainstream winemaker, but – with his wife Angela - among the small, but growing group of biodynamic winemakers. Siema Wines is a Virginia-based importer/distributor of fine wines from small to medium-sized wineries. Siema’s portfolio represents over 500 wines from all over the world and the majority of wineries represented are family-owned and operated. Founded and developed under the direction of Emanuele Gaiarin, Siema Wines today is a leading wine supplier in the Southeast and Midwest of the US. Burgenland is one of Austria’s 4 wine regions – Lower Austria, Styria, Burgenland and Vienna. For many years it was a bit on the margin, although it has a log wine growing tradition. Burgenland belonged to Hungary until 1921 when it was annexed to Austria post WWI. It is a melting pot of Magyar, Slavic and Austrian cultures. Many of the towns have two names, one Croatian or Hungarian and the other name Austrian. The vineyard area of Burgenland totals 14.000 hectares and comprises 4 areas: (1) Neusiedlersee: At the edges of the vast and shallow Lake Neusiedl, a variety of grapes are grown on 9,100 hectares of vineyards, including world-famous noble sweet wines. (2) Neusiedlersee-Hügelland: At the foot of the Leithagebirge and west of Lake Neusiedl, a variety of grapes are grown on 4,150 hectares of vineyards, including the renowned Ruster Ausbruch. (3) Mittelburgenland: On 2,100 hectares of vineyards, one red grape variety plays the leading role: Blaufränkisch. (4) Südburgenland: One of Austria´s smallest wine-growing areas, where excellent terroir wines are produced from 500 hectares of vineyards, which are situated mainly on the Eisenberg, with Blaufraenkisch being the typical red wine. “Our estate represents what used to be common practice everywhere in the Pannonian countryside: a mixed farming operation, managed by an extended family” said Werner via Skype. Thus, Weingut Meinklang, which is run by Werner and his wife Angela, is just a part of a much larger mixed farming operation. And, the whole mixed farming operation is done on the basis of biodynamic principles. The farm has 3 main components: livestock, agriculture and wine. We started a bit of a discussion about what he is doing and why, but could only scratch the surface. This is all very fascinating and pretty much avant-garde stuff for me. For example, typically winemakers age their wine in stainless steel tanks, wooden barrels or in the bottle. The Michlits’ have constructed 100 concrete eggs and age the wine in these eggs. I am looking forward to visiting the Michlits’ later this year on a trip to the Burgenland. The fundamental objective of their biodynamic cultivation, as Werner explained, is the creation of a farm as a self-sufficient living organism through the keeping of cattle, production of its own seeds and feed, fertilisation with farm-produced compost or manure and the growing of leguminous plants. Importantly, in the livestock department of the mixed farm, more than 300 Angus cattle have become part of the farm. “They are at the center of our mixed farming operation” Werner said. He explained to us that these good-natured beasts of the steppe are wonderfully adapted to the Pannonian grasslands and are not only an aesthetic addition to the Seewinkel landscape, but they also complete an ecological circle. “We keep approximately 300 mother cows and calves at present and our goal is to eventually extend the number of mother cows alone to 300.” In addition, the Michlits are breeding a special kind of pigs - Mangalitsa pigs - on the farm. “Cattle, horses, and pigs - our animals are of very special significance, as they serve a very useful purpose by providing manure for our farm. In turn their feed comes from agricultural produce from our own farm. Their excrement is composted and processed and subsequently becomes a valuable source of natural dung for our vineyards and fields – a unique occurrence in the wine lands of Austria.” In the agriculture department, the farm also includes an apple orchard. “Meinklang is more than a fancy name” Werner said “There is more behind it”. “Mein” = “My” Means: the personal signature of the young winemaker couple Werner Michlits and his wife Angela. And “Klang” = "sound" symbolizes: the harmony with nature. The wines are intended to fully reflect the nature, in which they arise. When it comes to winemaking, Werner felt that there was little to say about the winemaking facilities. “Because we do as little as possible there.” Indeed, working gentle and hygienic in the cellar is nothing special anymore, but the Michlits’ doing it without chemicals is. Of course, fermentation takes place with wild yeasts as they appear naturally in the vineyards and the cellar. And then there are the 100 concrete eggs. Here, the Michlits’ have chosen to be really creative. They have developed a new method of vinification and aging in 9 hectoliter concrete “eggs” (egg-shaped vessels). Werner was inspired by the egg the way it appears in nature. From his point of view the egg is nature’s ideal form for making wine. Werner and Angela believe that if the wine ages in these eggs, it develops the finest aromas and, most importantly, the highest rate of natural stability. So, less sulfur, for example, is needed. What the Michlits’ practice is really at the forefront of winemaking. They are radical fighters for their cause. They are not alone on this route and there are many others. But these “green” winemakers come in different colors. I just tasted the Santa Julia wines of Familia Zuccardi, who produce mass wines in Argentina with organic grapes. Argentina, in general, is very well suited for organic winemaking. “We practice sustainable agriculture in the vineyard” said Yann Beyer when I visited Domaine Leon Beyer in Alsace. The Donkey and Goats Winery in Berkeley produces wine according to the natural wine concept in the midst of the city of Berkeley without owning any vineyards. Researchers have found out that from a point of view of minimizing the carbon footprint, New Yorkers should drink Bordeaux instead of domestic wine from California. The following tries to shed some light on the different concepts of “green” winemaking. Vegan: Vegan refers to the process of fining the wine - eliminating undesirable items - with fining agents made from animal products, such as fish bladders and egg whites. As an alternative, Bentonite, a specific type of clay, is used for clarification in vegan wines. It’s important to note that vegan or vegetarian wines may or may not be made from organic grapes. Today is the second annual #Chardonnay day. This is a global event set to run 24 hours in order to give everyone time to have a glass of Chardonnay when it makes sense in their time zone. All you have to do is share on Facebook, Twitter, YouTube, Foursquare or any other social site using the #Chardonnay hash tag all day May 26th. You'll be able to search what other wine lovers are sharing by searching posts using the #Chardonnay hash tag. Chardonnay is grown wherever wine is made, from England to New Zealand, although the best Chardonnay comes from the Bourgogne. It is one of the most widely-planted grape varieties in the wolrd, with over 175.000 hectares. This is a French-French joint venture which produces 2500 cases of ulta-premium sparkers in the Monticello area in Virginia in the US. Claude Thibaut and Manuel Janisson bring to this sparkling wine, which is 100% Chardonnay, generations of tradition from the Champagne region of France and the favors and essence of the Virginia terroir. President Obama had it at his first State Dinner. And it has become the darling of the Washington DC restaurant scene, because it is local and outstanding. I met Claude Thibaut recently at screwtop winebar in Arlington, where he introduced us to his Virginia sparklers and his partner's Champagnes. Over the past 12 months, I had Chardonnays at various occasions. The following were in particular memorable. First, I tasted a range of Domaine Long-Depaquit Chardonnays from Chablis with Managing Director Matthieu Mangenot at Pearson’s in Washington DC. Second, Brian Talley from the Central Coast in California came to Cecile’s Wine store in Virginia and presented his wines, including a Chardonnay. Third, Dennis Cakebread brought a Chardonnay to a winemaker dinner at Evo Bistro in McLean, Virginia. Fourth, when I traveled in South Africa, I had a memorable afternoon with Antony Hamilton Russel, the producer of outstanding Pinot Noir and Chardoannay wines in the Hemel en Aarde (Heaven and Earth) valley, just behind the seaside resort of Hermanus in Walker Bay. Fifth, when I am in Germany, I mainly drink Riesling. But Germany also produces Chardonnay, in particular, in the South, in Baden, towards the Bourgogne in France. I had an excellent Chardonnay Sparkler at Weingut Bernd Hummel. Domaine Long Depaquit Chablis Villages 2009 - All in stainless steel. No oak. Domaine Long Depaquit Chablis 1er Cru Les Vaucopins 2008 - There is 20% oak in this cuvée. Domaine Long Depaquit Chablis 1er Cru Les Vaillons 2008 - Just 10% of the final blend sees some oak here. Talley Vineyards is part of Talley Farms, a diversified family farming company in California in the Central Coast area. It was established in 1986 and is today one of California’s acclaimed producers of Chardonnay and Pinot Noir. Wines are produced under the Talley Vineyards and Bishop’s Peak brands from over 200 acres of vineyards of the Talley family’s six vineyard sites in two valleys. How do they make the Chardonnay? The Chardonnay is cluster sorted and whole cluster pressed. The juice is only minimally settled in tank and then racked into medium-heavy toasted French oak barrels from the Allier and Vosges forests. The level of new oak used depends on the wine, but generally ranges between 25% and 35%. All of the wine is barrel fermented with various cultured yeast strains as well as native yeasts. Maximum fermentation temperatures are cool and range from 68°-74°F to preserve the natural fruit characteristics of the wine. All of the wine ages sur lie and undergoes malolactic fermentation to soften the natural acidity while adding richness and complexity to the finished wine. The Estate and Oliver's Vineyard Chardonnays are typically bottled after 11 months in barrel, while the Rincon Vineyard and Rosemary's Vineyard wines age 14-16 months in barrel. Bishop's Peak Chardonnay 2007 - crystal clear Central Coast fruit. Talley Vineyards Chardonnay Estate 2008 - bright and energetic with nice complexity on the back. Talley Vineyards Chardonnay Rincon Vyd 2007 - rich, deep, and complex. My down-the-road Bistro when I am in McLean, Virginia - Evo Bistro - was the site of a fun winemaker dinner hosted by Dennis Cakebread. Chef Driss Zahidi of Evo Bistro offered a delectable menu paired with the fabulous Cakebread Cellars wines. Cakebread Cellars is a small producer of top wines in the Napa valley. To Cakebread Cellar's original 22 acres, an additional 12, adjacent to the original property, were added in 1982. In 1985, 11 more acres in the Rutherford area were acquired. In 1987, the purchase of the 25-acre River Ranch brought total acreage to 75, all of which in the Rutherford appellation. In 1999, an acquisition added substantial vineyard acreage on Howell Mountain. In addition, Cakebread draws on 400 acres of vineyards over which the Cakebreads exercise full control. We had a Chardonnay with the hors d’oeuvre. Technical notes: Grape variety: 100% Chardonnay; Alcoholic Content: 14.5%; Vineyards: 100% Napa Valley; Total Acidity: 0.63g/100ml; pH: 3.65; Harvest Dates: September 4 - October 1, 2008; Fermentation: 92% French Oak & 8% stainless steel; no Malolactic; Barrel-aging: 8 months in French oak, 36% new, with periodic stirring of the lees. Winemaking notes: After night-harvesting and whole-cluster-pressing the grapes, 92% of the juice was fermented in French oak barrels and 8% in stainless steel tanks. Because the 2008 vintage produced fruit with tremendous varietal intensity and exceptionally well-balanced flavors, the only winemaking intervention required was to select the right barrels to highlight the wine’s lovely natural attributes. The Chardonnay spent eight months aging in French oaks barrels, 36% new, with periodic stirring of the yeast lees to further enrich texture and flavor. Tasting notes: medium gold in the glass, butter, green apple and spices on the nose, a medium- to full-bodied wined, moderate acidity, creamy, not too oaky, ripe apple and pear flavors on the palate, long, crisp, finish, an elegant California Chardonnay. The stop at Hamilton Russell Vineyards, the producer of outstanding Pinot Noir and Chardonnay wines in the Hemel en Aarde (Heaven and Earth) valley, just behind the seaside resort of Hermanus in Walker Bay, was our last stop on a recent South Africa wine trip, but it was one of our best stops. Pictures: Christian G.E.Schiller and Anthony Hamilton Russell of Hamilton Russell Vineyards, Producer of Outstanding Chardoannay in the Hemel en Aarde (Heaven and Earth) Valley in South Africa. I toured – with the Weinfreundeskreis Hochheim – the Kraichgau, the most northern sub-region of Germany’s most southern wine region, Baden, where we visited Wein- and Sektgut Bernd Hummel, located in Malsch. The vineyard area totals just 10 hectares, but Bernd Hummel also buys fruit from other growers, equivalent to 50.000 bottles. Bernd Hummel led the cellar tour and the tasting. He is - like me - an economist by training, with a passion for wine. Maybe this is the reason, why I like this Wine Estate so much. Bernd got into winemaking through his wife, whose family was growing grapes -like so many in the Baden wine region – for the wine co-operative. He took over the vineyards of his father- in-law and a established a winery 30 years ago. He has been very successful and now ranks – with 2 Gault and Millau Grapes – among the top wineries in the Kraichgau. His portfolio comprises red and white still wines, sparklers and brandies. Red wine accounts for a little less than half of his wines, with Pinot Noir in the lead. Bernd Hummel is open to new trends and was the first one to plant Cabernet Sauvignon in northern Baden 20 years ago; Merlot followed 10 years later. The top red wines are matured exclusively in new barriques, all of French oak, and at varying toasting levels. Bernd Hummel uses in good years up to 300 barrels. Bottle-fermented sparkling wines as well as brandies are also produced. Bernd Hummel sells 85 % of his wines directly to the consumer. The remainder goes to a few restaurants and retailers. Nothing is exported. We started the cellar tour with a 2007 Chardonnay Sekt brut, methode traditionelle, which impressed me very much and reminded me of a Champagne. Bernd Hummel produces his Sekts all by himself and lets them age for at least 30 months. I have met Hans Lang on various occasions in Germany, including at his winery in Hattenheim and I appreciate his world class wines very much. Thus, back in Washington DC, I was delighted to find his Edition Maximilian wines at Trader Joe’s at very reasonable prices. The Weingut is located in Hattenheim in the Rheingau in Germany, but Hans Lang also owns vineyards in Assmannshausen, the red wine village of the Rheingau. Hattenheim is nestled between the rolling green Taunus hills and the Rhine River. The wide expanse of river at Hattenheim reflects the heat of the sun and moderates between night and daytime temperatures. Some of the finest examples of Rheingau wines are produced from grapes grown in the vineyards of Hattenheim. Hattenheim's ties to winemaking date as far back as Roman times. Most of today's vineyards were first mentioned in the Cistercian monastery, Kloster Eberbach's records, composed sometime before 1211. Weingut Hans Lang is new estate by German standards; it was founded by Johann Josef Lang in 1953, and has been run by his son Johann Maximilian (Hans) Lang since 1972. The vineyard area totals 18 hectares, including, holdings in the Grand Cru classified Hassel and Wisselbrunnen (Hattenheim) sites. As the Rheingau is most famous for its Riesling wines, Hans follows the tradition in producing 75% Riesling. But he also devotes a considerable amount of his energies to producing Pinot Noir wines. This grape was imported to this region by monks from Burgundy in the 11th century. It accounts for 15% of the Weingut Hans Lang’s vineyard area. Indeed, Hans is regarded as something of a pioneer in this field; he was the first winemaker in the Rheingau to employ small French oak barriques for the aging of his red wines and has been a member of the Barrique forum since 1995. Weingut Hans Lang is a member of the VDP. Integrated, sustainable vineyard practices are employed in the Lang vineyards, the grapes are always harvested by hand and undergo strict selection to ensure only the healthiest fruit is used for our wines. To promote ripeness, Hans deliberately restrict yields. Temperature-regulated stainless steel tanks are used in the winery and certain wines benefit from aging in either traditional German oak barrels or small French oak barriques. Approximately 90% of production focuses on dry wines. When vintage conditions permit, sweet botrytis dessert wines such as Beerenauslese and Trockenbeerenauslese, as well as Eiswein are produced. In addition, bottle-fermented sparkling wines are also produced. Hans has studied oenology and viticulture at the renowned Geisenheim Wine Institute. Edition Maximilian is a second label of Hans Lang. I am not sure, Edition Maximilian wines are sold in Germany. I have bought them at Trader Joe’s, an US discount store, in Washington DC. 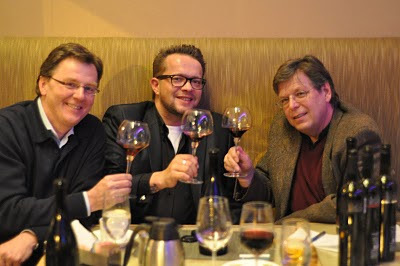 The Edition Maximilian wines come as a Riesling and a Spaetburgunder, which Hans calls – for marketing reasons - Pinot Noir. They are both in a very reasonable price category - around US$ 7 - and are both crafted for consumers who prefer a bit of sweetness in the wine. Here are the two Edition Maximilian wines I bought and tasted. 2008 Pinot Noir Rheingau, Edition Maximilian: This is a soft, uncomplicated red wine with a lot of fruit and little, if any, wood flavors. It's relatively low in alcohol (11.5%) and semi-dry, which accentuates the fruitiness. In terms of tannin, the wine is on the light side. At US $ 6.99, it is a steal. An easy drinking wine for day to day consumption. 2009 Riesling Spaetlese Rheingau, Edition Maximilian: This is a Spaetlese, i.e. the grapes were harvested at an elevated level of sweetness. Despite the increased sugar level, the grapes harvested at Spaetlese level do not have enough sugar so that mother nature can make sweet wines out of them. To produce sweet Spaetlese wines, you need a bit of help by the winemaker, either by stopping the fermentation or by adding sterilized juice to the finished wine or a combination of both. I guess, Hans went for the third option and what he produced is a delicious sweet-style Riesling with a very modest level of alcohol (9.5%) - a type of wine that has made the middle Mosel so popular. Consider that it costs only US$ 8.99, it is also a steal, produced by a big Riesling gun. Of course, the Edition Maximilian Riesling Spaetlese it does not have the complexity and quality of Weingut Hans Lang’s regular Riesling Spaetlese wines. But then you are in a different price category. By the way, these wines are readily available in the US and imported by www.trulyfinewine.com, which also represent Weingut Barth, also located in Hattenheim. I have written about Weingut Barth here. The Wines are imported by Plume Ridge Wine Negotiants in California and shipped by Mo-Rhe-Na. The latter is a trade export body representing wine estates, their cellars and great vineyards from all mayor German wine growing regions and takes its name from the Mo(sel), Rhe(in)and Na(he) regions. It is co-owned by Hans Lang. The Wine Enthusiast – one of the leading US wine journals – came to Washington on May 20, 2011 for the annual Toast of the Town event. Similar events were already or will be organized by the Wine Enthusiast in Chicago (June 17), New York City (May 5), Miami (September 23) this year. In each city, the event is held in a setting of historic and/or cultural significance. In Washington DC, the event was held at the National Building Museum – a stunning venue - and featured wines from wine producers from around the world and dishes from top Washington DC area restaurants. 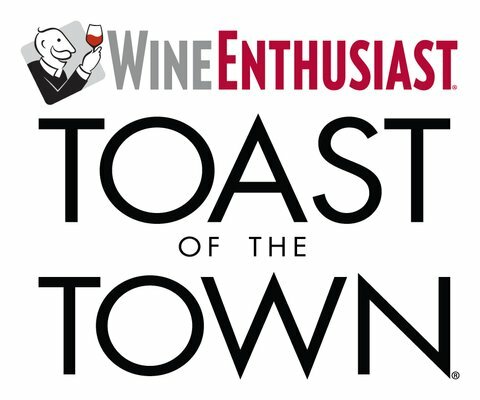 See Wine Enthusiast and Toast of the Town for more information. The Wine Enthusiast contacted me and asked for a write-up on schiller-wine, which I happily agreed to. The Toast of the Town is quite an event. It is not a trade event, where people from the retail and restaurant scene taste and compare wines with a view of including them in their portfolio. It is a big party, aimed at the end-consumer, where she or he can leisurely taste the wine poured by representatives of top wineries from around the globe and the food prepared by the chefs of top restaurants from the Washington DC area. While I focused on the wines, I heard many guests comment how the food was the best part of the evening for them. And all this to the sounds of live Jazz music. In sum: Gorgeous locales. Delicious wines. Gourmet food. Top jazz music. The event is not exactly cheap - $ 169 for a VIP ticket and $ 109 for a regular ticket. Before Toast of the Town opened its doors to general admission from 7:00 pm to 10:00 pm, VIP ticket holder could enter the event an hour earlier. That gave them the opportunity for better one-on-one time with the winemakers and restaurateurs while the venue was a little quieter. Also, the wines poured in the first hour were different from those poured after 7:00 pm. Several hundred people, all dressed their best, turned out the 2011 Toast of the Town in Washington DC and – I am sure – had a lot of fun. As far as the wines are concerned my guess is that about 2/3 of the tables were importers/distributors and 1/3 wineries. Though I did not see any winemakers at the tables, the choice you had in terms of wines was amazing: William Hill, Beaulieu Vineyard, Hess Collection, J. Lohr, Symington Family Estates. Yalumba, Hogue Cellars, Alexander Valley Vineyards, just to name a few. Many of my favorite Washington DC restaurants were present: Bastille, Eatonville, Mon Ami Gabi, Sonoma Restaurant and Wine Bar, Capital Grille, and Palm. Here are a few restaurants and winemakers/importers/distributors, where I spent more time than at others. On my recent tour in South Africa, I also stopped at Donald Hess’ Glen Carlou Estate in Paarl valley. We visited the fascinating contemporary art exhibition, had lunch in the fabulous restaurant and tried some of the excellent Glen Carlou wines. Donald Hess is well known in the US for being the owner of the Hess Collection winery in California. But he has owns several other wineries all over the globe in Australia, Argentina and in South Africa. (1) The Hess Collection Winery on Mount Veeder in Napa Valley with a vineyard area totaling 270 hectares marked the beginning of Donald Hess's venture into the 6 New World cellars and vineyards. (2) Artezin Wines in Napa Valley, which specializes in handcrafted wines from the heritage grapes Zinfandel, Petite Sirah, and Carignan. (3) Sequana Wines produces single vineyard Pinot Noirs from the Russian River Valley in Sonoma and Santa Lucia Highlands in Monterey. (5) Bodega Colomé in Argentina, with presumably the highest vineyard in the world at 10,200 feet/3,111 meters above sea level in the northern part of the Calchaqui Valley. Bodega Colomé focuses on Argentina's two traditional varietals, Malbec and Torrontes, in biodynamically farmed vineyards. (6) A major share (85 percent) in Peter Lehmann Wines, Australia. Founded in 1980 by the legendary Peter Lehmann and now managed by his son, Doug Lehmann, Peter Lehmann Wines is one of Australia's most respected wineries, located in the Barossa Valley. I was a bit sad that Glen Carlou wines were not poured. But I enjoyed very much the 2009 Sequana Vineyards Pinot Noir. I met James MacPhail, the winemaker, recently; his Pinot Noirs are stunning. I am not a regular Port drinker, but when Rupert Symington came to town a few weeks ago, I got very excited and had to meet him. Symington Family Estates is the leading producer of premium quality Ports, with the combined sales of the family’s Port companies making up over a third of all premium Port sold throughout the world. In addition, the group also produces Madeira and non-fortified Duoro wines. I was thrilled to find the Symington Family Estates wines at the Wine Enthusiast 2011 Toast of the Town in Washington DC. While the Douro region is associated primarily with Port wine production, it produces just as much table wine as it does fortified wine. While table wine has always been produced in the region, for a long time little of it was seen outside the region itself. A few Douro wines made their appearance on the international market from the 1970s, but it was not until the 1990s when a large number of wines made their appearance. My wife Annette liked very much the DOW’s VALE DO BOMFIM 2008, which was poured at the Toast of the Town. I think it retails for $ 9.99, which is a steal. The company was founded by Andrew James Symington who arrived in Oporto from Scotland in 1882, and initially joined Graham's. By 1905, Andrew James Symington was a partner of Warre & Co and in 1912 he became a partner in Dow's Port. In 1970, the Symington family bought both Graham's and Smith Woodhouse. In 1989, the Symington family became a partner of the Madeira Wine Company. From 1999, dry Douro wines were added to the Symington range. Today no less than seven Symingtons (six from the 13th generation in the Port trade) work in the business. Beringer in California was founded in 1876 by the German brothers Jakob and Friedrich Beringer from Mainz, where I had spent 10 years before moving to the US. I recently lead a tasting about American wines in Hochheim, Germany, near Mainz, and of course included a Beringer wine. I am always pleased to have a Beringer wine in the glass and was so very much at the Toast of the Town. Domaine Select Wine Estates (DSWE) is an importer based in New York, focusing on wines that are not really mainstream wines, but special, off-the-beaten track premium and ultra-premium wines. At the Toast of the Town, DSWE's Daniel Hubbard offered a selection of amazing Austrian wines. But the DSWE portfolio includes wines from all over the world, including Germany. I had organized with Daniel a tasting of German Rieslings a few weeks ago for the German wine society in Washington DC, where he presented an astonishing line-up of mainly dry and all biodynamic German Rieslings. I would have loved to see some of these wines at the Toast of the Town, but the Austrian wines he brought were also outstanding. These were all wines of the Terry Theise portfolio. Terry is one of the US’s most influential wine importers who focuses on German and Austrian wines as well as on Grower Champagnes from France. I like the 2009 Meddersheimer Rheingrafenberg Quarzit Riesling, Hexamer, not because it was the only German wine at the event, but because of its amazing minerality. Sonoma County’s Alexander Valley was mostly prune orchards and pastures when, in 1962, Maggie and Harry Wetzel purchased a large portion of a homestead built by Cyrus Alexander, the valley’s nineteenth century namesake. They raised livestock, cultivated bountiful gardens and restored Alexander’s original home, making it the center of family life. With an eye to their neighbors in nearby Napa Valley, the Wetzels boldly planted premium grape varieties, among the first in the area. Then the family built a small winery. Hank Wetzel, oldest son of Maggie and Harry, produced Alexander Valley Vineyard’s first wine in 1975. Now the third generation of Wetzels has joined the winery. Harry Wetzel IV, who I met recently in Washington DC is assistant winemaker while younger brother Robert is the National Sales Manager. Today, the Wetzel Family Estate grows fourteen grape varieties, on diverse sites stretching from the banks of the Russian River up onto the hillsides. Alexander Valley Vineyards produces 100,000 cases annually, 17 varietal wines and proprietary blends. Chardonnay, Merlot and Cabernet Sauvignon constitute roughly half of total production. Other varietals include Pinot Noir, Zinfandel, Gewurztraminer, Syrah, Sangiovese, Viognier, and Cabernet Franc. Eatonville is a very important town for African-Americans in Florida, as it became the first African-American town in the US in 1887. The Restaurant Eatonville is located in the historic U Street Corridor, where Zora Neale Hurston and fellow writer/poet Langston Hughes, both famous African-Americans, enjoyed a lively social and cultural life during the early 1920s. Zora Neale Hurston, a writer and anthropologist, was one of the brightest lights of the Harlem Renaissance in the 1930s. Hurston was considered by many to be the pre-eminent black female writer in the country. The Restaurant Eatonville pays homage to Hurston’s Washington DC’s connections. It is named for her childhood hometown in Florida, the setting of her most famous novel “Their Eyes Were Watching God”. The House-Cured Duck Prosciutto with Toasted Hazelnuts, Citrus Mascarpone and Pickled Fruit was delicious and reminded me of two evenings at Eatonville not so long ago. One evening was organized around Deborah Brenner. She is the author of the book “Women of the Vine” and she is the CEO of the “Women of the Wine Cellars” winery, featuring hand-crafted, limited production wines, all made by female winemakers. The other one was a winemaker dinner with one of Oregon's pioneering winemakers - Myron Redford - and his Amity Vineyards wines. Finally, I was very happy to see my dear friend Klaus Wittauer, who has done so much for promoting Austrian wines on the US East Coast. I know his wines very well. They are all great wines from interesting winemakers in Austria. Among others, Klaus poured the 2008 Hillside Syrah-Zweigelt-Merlot from Leo Hillinger, which I was very happy to finish the evening with. I had tasted this and other Hillinger wines recently with Klaus and assistant winemaker Michael Hoeffken in Washington DC as well as in Vienna, Austria.